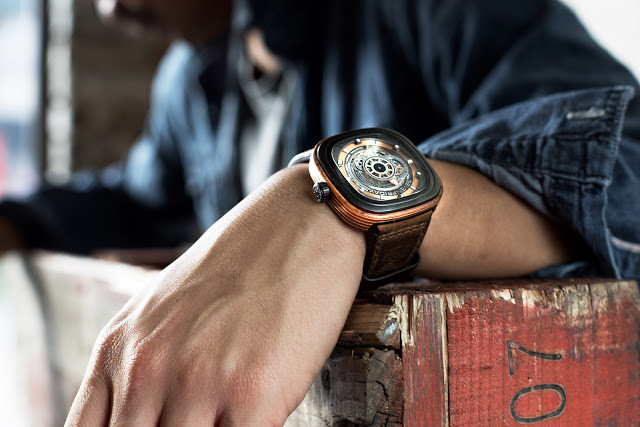 Just months after the launch of the V-series, SevenFriday has returned to its original model, the cushion-shaped P-series. The P2B/03 “Woody” is clad in a ring of laminated hardwood, made up of several layers of American walnut, beech and cherry bonded together and sliced lengthwise to reveal the contrasting grain and colour. 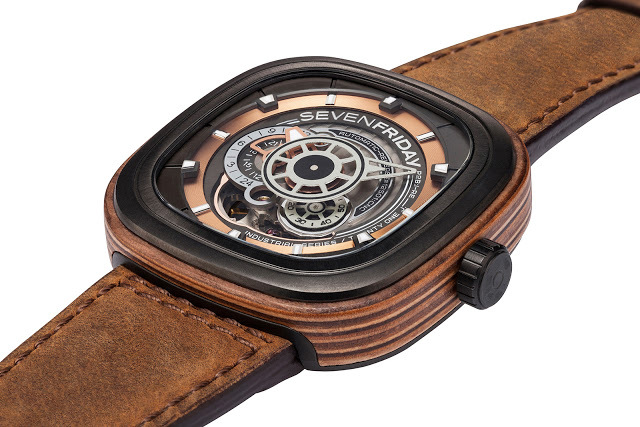 SevenFriday first used wood for the “animation ring” (the outer ring around the case) on the P3/2 Riviera in 2013, which was covered in Canadian walnut. 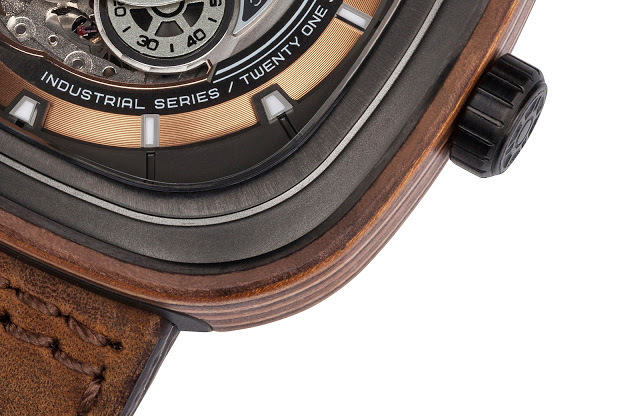 In contrast, the new P2B/03 “Woody” has an animation ring made of laminated hardwood. Beech, cherry and walnut sheets were shaped and then layered, revealing the varying tones of each wood type lengthwise on the flanks of the case. This was done by Watschinger, an Italian woodworking specialist. Measuring 47mm by 47mm, the case is exactly the same size as the rest of the P-series watches. 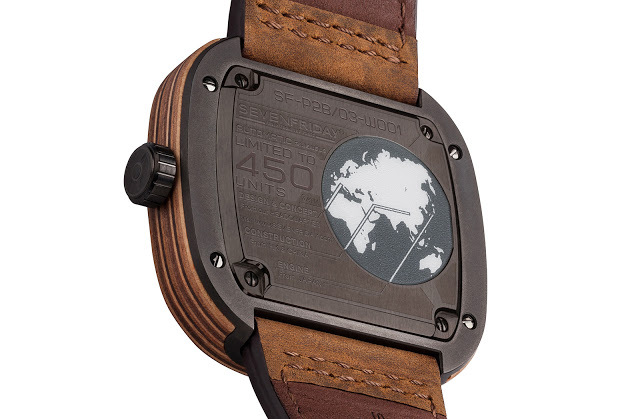 The inner case is stainless steel, finished with a dark grey coating, while the dial has copper-toned highlights. 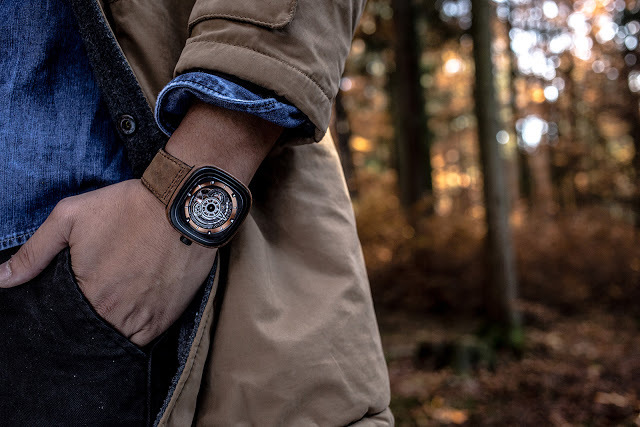 Both the hands and hour markers are filled with Super-Luminova, a first for SevenFriday, meaning they glow in the dark. 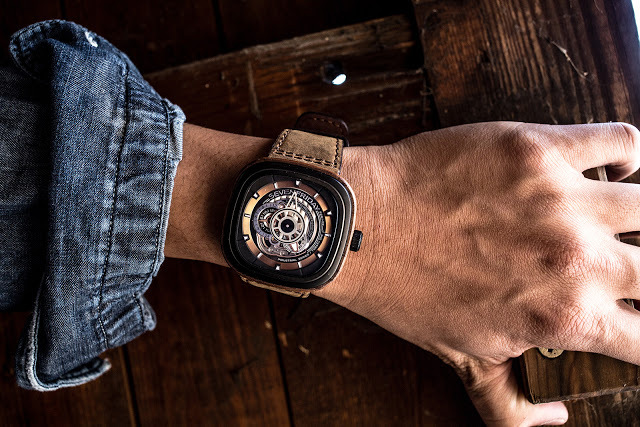 Another first is the near field communication (NFC) chip embedded in the back under the resin globe medallion (the map indicates where SevenFriday watches are made: designed in Switzerland, made in China, and equipped with a Japanese Miyota movement). 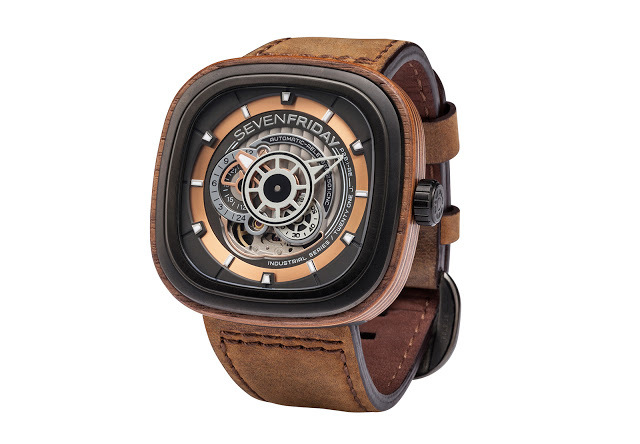 This allows the watch to be authenticated via the SevenFriday smartphone app, and also for owners to register their watch by scanning it. Limited to 450 pieces, the P2B/03 “Woody” is priced at SFr1388 without taxes, and in Singapore it’s S$2390 including tax. It will be available at authorised retailers in early December.